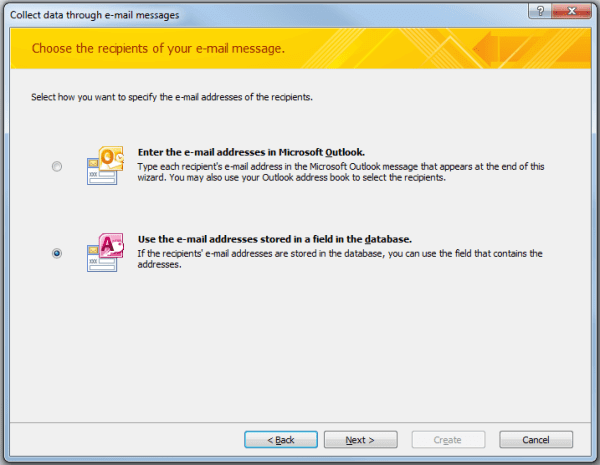 How To Import Outlook Email Into Access Database? 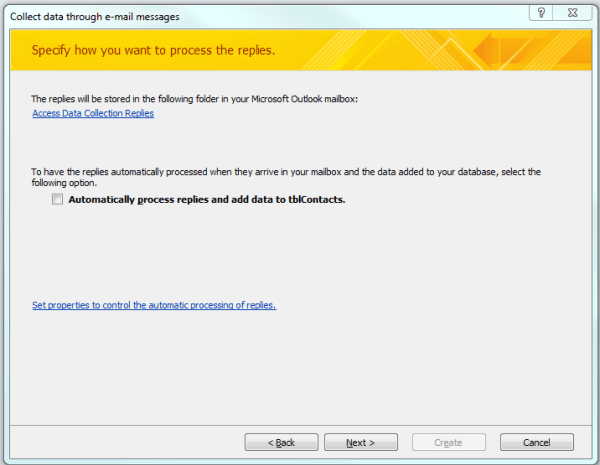 The complete post emphasizes on how to import Outlook Email into Access Database. So, explore some best ways to Share Data between Access and Outlook without any much effort. I am trying to import emails to an Access database. All works fine, but I would like to import the email’s Received and Sent Date/Time into the database as well. This field does not show up in the import wizard. I then tried it on another computer with a newer version of Outlook and Access but there the import to Access option doesn’t show up at all. I have created some software for quoting and order fulfillment in MS Access 2007. I want to be able to select an email in Outlook’s Inbox, hit a custom button which then checks the sender’s email address in my Access database. It should then present a list of all orders associated with that email address and allow the user to select one of them. Once selected, a copy of the email will then be created in the database against that order. I’m after some guidance on the best way to do this. My Access Database is split with a frontend and a backend. I’m experienced with VBA in MS Access, but have very limited experience with such integration tasks. Hopefully with a little guidance I’ll be able to figure the rest out. 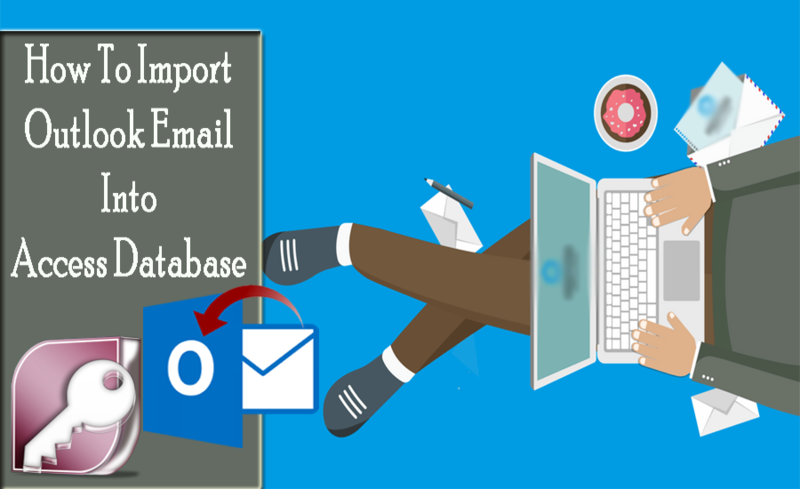 Why You Need To Import Outlook Email Into Access Database? Access is Microsoft’s database software and outlook is email software. What if you need to work with theses two different software at the same time? Don’t worry as now you can easily collect or update information through emails by using Microsoft Access 2007/ 2010/2013/2016 with Microsoft Outlook 2007/2010/2013/2016. Access helps you in this through making a data collection form and sending the form in email message. When your email recipients return the completed forms, you can choose to have the collected data automatically processed and stored in some particular access database. By doing this you can save much of your time and effort which usually involved during copy/ paste or manual data entry process. This tutorial gives you the best tips and tricks on performing integration between access and outlook. 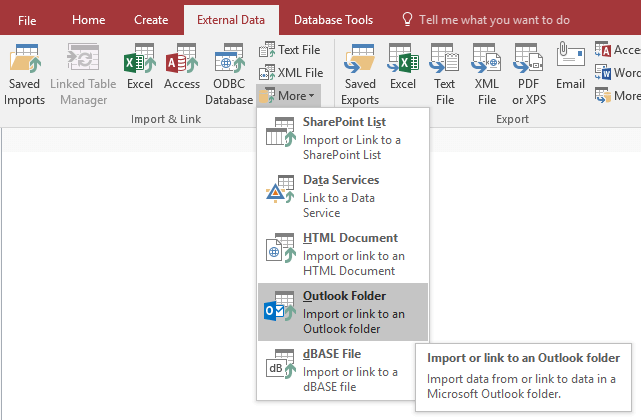 So, if you need to work with your access database and email at the same time then check out this tutorial sharing data between Access and Outlook. 1.First of all you need to create a new blank database. 2. After then select a table. 3. Now select for the External Data tab. 4. Now go to the Import & Link group and tap to the More After then choose: Outlook Folder option from it. As this last option is quiet handy when you performs frequent work with the same data set which frequently keeps on changing. This option always helps you to have the latest data. By clicking on the plus sign you can expand the address book, mailbox, public folder etc. So, make selection for the data which you want to link into MS Access as a table. 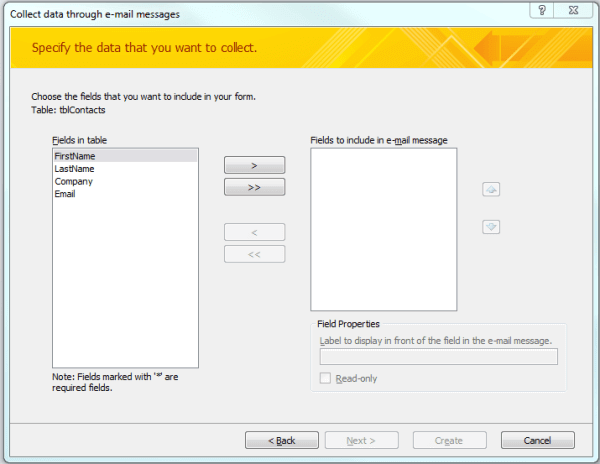 For example: if you want to link Contacts data then expand your mailbox and select the Contacts node. And tap to the Next option. 7. In last form of Wizard, specify linked table name and press Finish When Link/Exchange Wizard displays with the finished dialog box, then click the OK button. 8. Now you will see the linked table in your database. Make a new blank database. If you need to import access database back into outlook, you have to store the database in the Access 97-2003 .mdb format. As outlook 2007 and its later version won’t accepts the new Access 2007-2013 .accdb format. It’s an import and export limitation from the outlook. So in order to import access database table back to outlook, you need to use the Export->Text file command within access and then save it to the file with .csv-extension instead of txt-extension (or rename it afterwards). 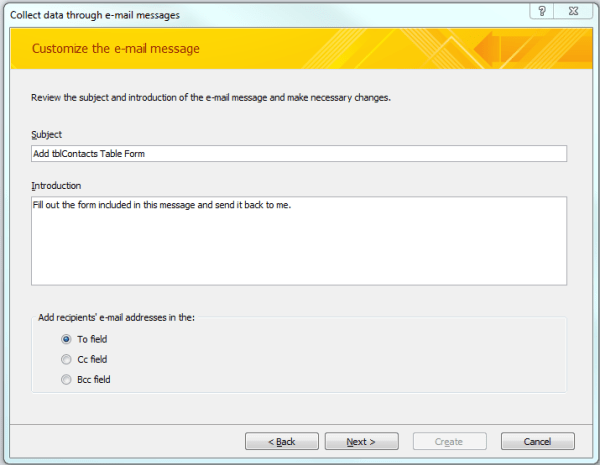 As in outlook there is an option to import from a CSV file. How To Add The Data Through Outlook To Access Database? Microsoft access has such features that seamlessly link your database table to outlook. This helps in easy collection of user data via email messages. 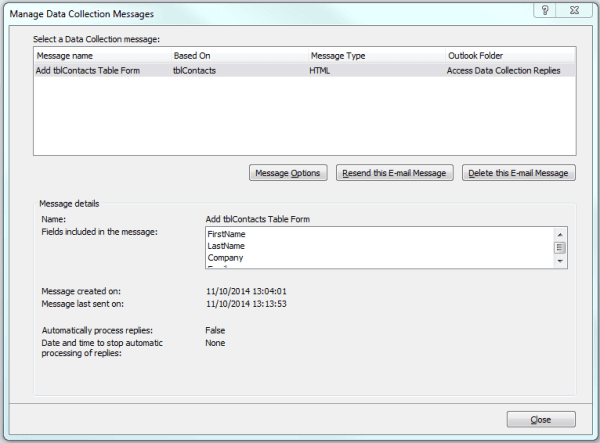 This section of the tutorial will show you the steps for making the complete setting of the email template for collecting the data. Along with the steps for processing the collected data. 1.Make selection of the table for which you needs to collect the data from the Navigation Pane. 2. Now go to the External Data tab on the Ribbon, in the Collect Data group, tap to the Create E-mail. 4. Now tap to the Next In the next open window you will get the option to choose the type of email form which you want to use. Here you will get two option i.e HTML or InfoPath forms out of which you can choose only one. If your user doesn’t have InfoPath installed on their PC then select the HTML. 6. If the table contains existing data, then the next screen that appears is where you will choose whether the data you are collecting are new information or for updating existing data in your table. 7. Tap to the Next option after making the selection. 8. The next screen allows you to select which fields from your table you would like to include in the email message for collecting the data. You can set the order of the fields or change the label captions for each field. 9. After selecting all the fields that you wants to collect, tap to the Next option for reaching to the next screen. 10. 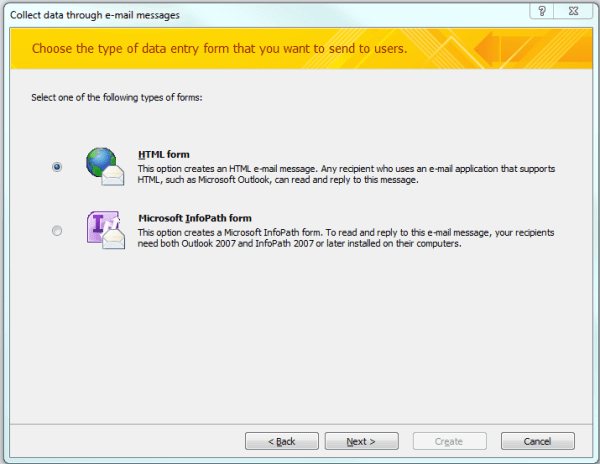 In the next open window user can specify which outlook folder is used to store email replies for collected data. 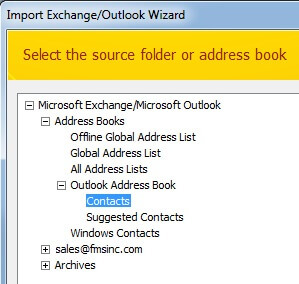 Well user can make changes to the default location by tapping to the folder’s name and then switch to the outlook window and either choose or create a new folder. 11. On the same screen, if you want all email replies to be processed automatically then you need to specify here only. This means that collected data will be automatically added to your access table. 12. 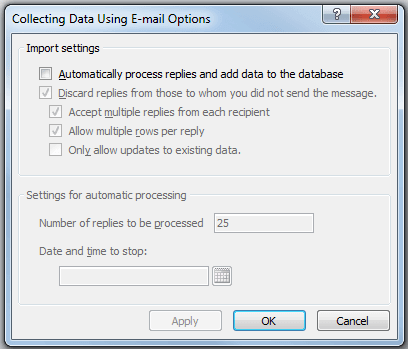 To control the data process, click on the link labeled as “Set properties to control the automatic processing of replies.” This will open the following options screen. 13. On the opened screen click Next to go to the next step. 14. On the next screen specify how you would like to provide the email address for recipients of your message. 15. If you have made selection for giving the email address from Access table. Keep clicking the Next option this will present another screen. 16. Select the email address field from current or related table and then tap to the next option. 17. The next opened window all you to specify subject line and the body of the message etc. 18. Tap Next to reach the next screen. This screen contains information only. 19. 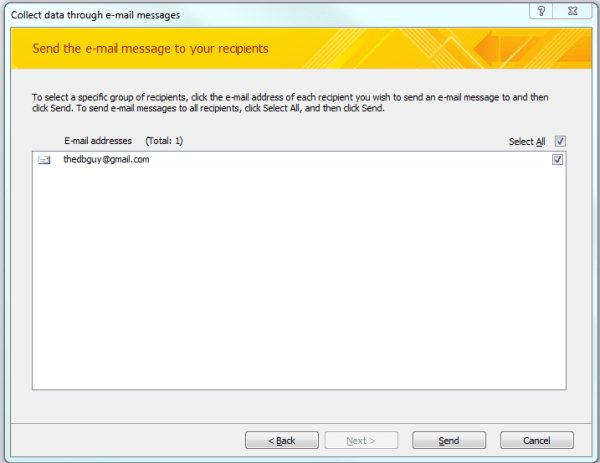 Hitting the next option again, allow you to select specific recipients for the email message. So, send any message to all of your recipients. 20. After completing up with your message tap to the Send. 21. Once your user gets the email messages, all they need to do is reply back after filling up the complete form in message with the asked information. 1.Go to the External Data tab on the Ribbon, in the Collect Data group. After then tap to the Manage Replies This will open up the Manage Data Collection Messages dialog window. 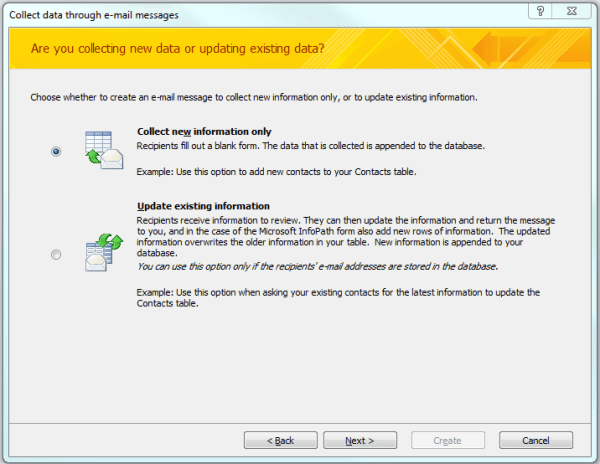 2.With the data collection message template you can make changes to the highlighted. After then click on the Message Options button. 3. 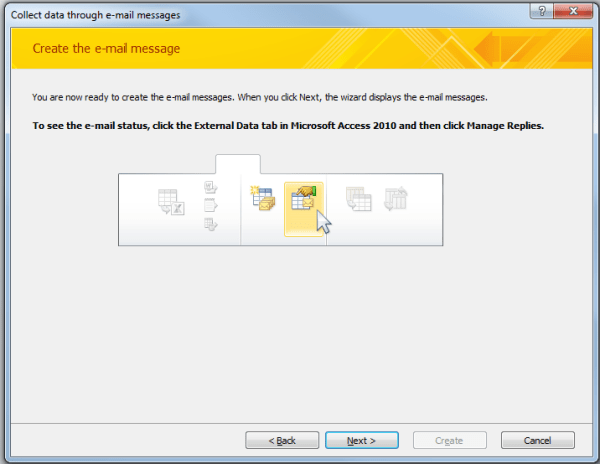 The next open screen will be the “Collecting Data Using E-Mail Options” dialog window. 4. In this opened screen, you can either check or un-check the options you like to choose. 5. Tap to the OK option to close the Options window. 6. 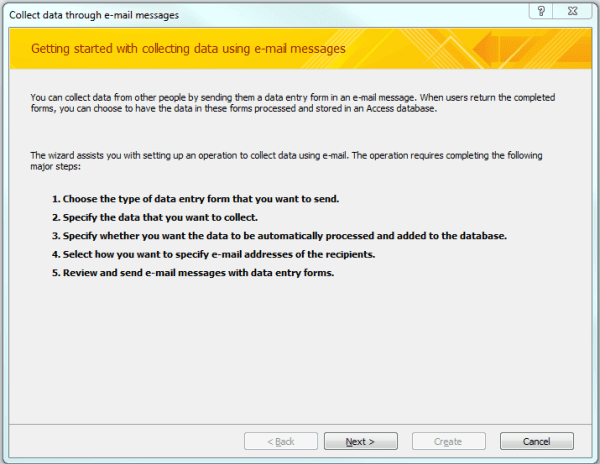 Hit the Close option on the Manage Data Collection Messages dialog window. 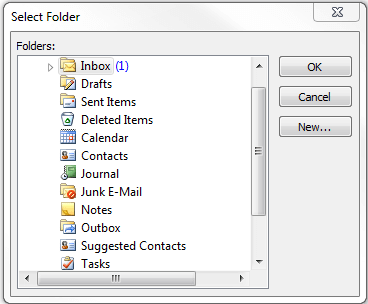 1.Assign the folder which you have selected for storing the collected data in Outlook. 2. Make a right-click on the user’s reply which you want to process and choose Export Data to Microsoft Access. 3. On the Export data to Microsoft Access dialog window, verify data that is to added to the table and hit the OK option. 4. After the successful exportation, you will see the confirmation window. 6.You must repeat these steps for each reply you want to process. 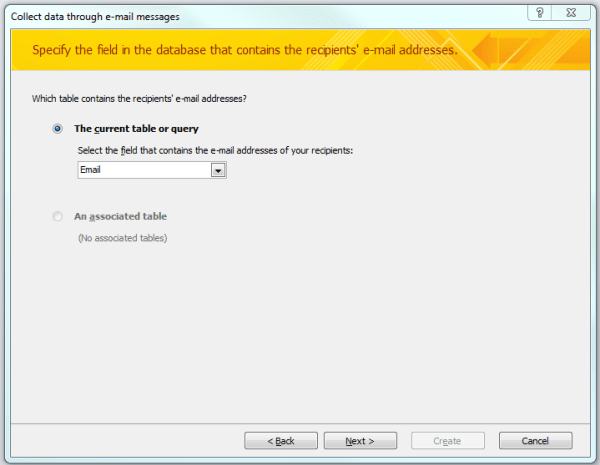 Hopefully, now you can easily operate Import Outlook Email Into Access Database task. Try the above mentioned steps carefully and do share your experiences with us in our comment section.